EstroBalance® / 30 tabs - Nature's Way®. 1 Daily Dose = DIM from 2 lbs. of BROCCOLI! Why take EstroBalance with absorbable BR-DIM? Diindolylmethane, in supplement form, can be difficult to absorb, unless it’s made with a special bioavailable form of diindolylmethane such as the BioResponse-DIM® complex, as found in EstroBalance. BioResponse-DIM complex provides an enhanced bioavailability delivery system for DIM so it’s easy for the body to absorb. Take 1 tablet daily with food. If extra support is required, take 2 tablets with food. Indolplex® & BR-DIM® are registered trademarks of and are licensed from BioResponse, L.L.C., Boulder, CO.
Why does EstroBalance® use DIM and not I3C? Diindolylmethane (pronounced: dye-indo-leel-methane), or DIM for short, as well as indole-3 carbinol (I3C) are plant nutrients found in broccoli, cauliflower, cabbage, and other related vegetables. Research has shown that DIM improves the way estrogen and other reproductive hormones are metabolized in the body. * However, the research on I3C has been mixed, with some studies showing benefits and other studies having negative results.As a dietary supplement, DIM provides the exact compounds that are found in vegetables. It’s fully active and ready to be absorbed, while IC3 must first be synthesized into DIM after it’s digested. When combined with vitamin E and phosphatidylcholine, DIM is highly absorbable. IC3, on the other hand, has an unpredictable absorption rate. The stability of IC3 is very low compared to DIM’s, too. Some research has shown IC3 may cause certain side effects, including stomach upset and dizziness; DIM has no known side effects. Therefore, EstroBalance® features active DIM. There is no I3C in the product. What is DIM (diindolylmethane) and how does it work? 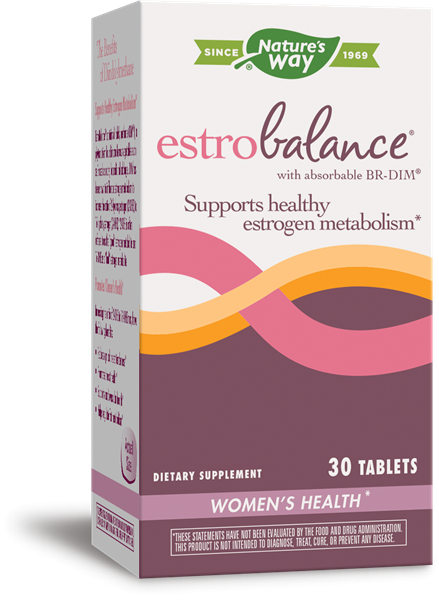 How does EstroBalance® support healthy estrogen metabolism? Do not use this product if pregnant, nursing or attempting to become pregnant. A harmless but noticeable change in urine color may occur during usage of this product. If taking any medications, consult a healthcare professional before use.